In order to give you a “glimpse behind the scenes” of our product development, our R&D guys share their discoveries and developments with you in the “Tech Section”. The information can vary from recent developments to useful “tricks & tips” on getting the best out of your Alcons system. Alcons' ribbon drivers were developed by Philip de Haan, sr. R&D engineer and 20+ year veteran in ribbon transducer technology. He is initiator of a number of significant patents and can be seen as "father" of today's high-output pro-ribbon technology. De Haan: "Since 1983 we've been expanding the learning curve and did a lot of research on new materials, techniques and production processes. We've tested every medium-to-large sized ribbon driver on the market, to see and measure for ourselves what the current status of ribbon development is. Now this know-how has led to a new generation of ribbon drivers with the RBN601 being the first result of that." Over the last years, the ribbon has gained popularity in the pro-audio market, because of the fast transient response and the accurate sound reproduction, required by today's new high-resolution media, like SA CD a.o.. The low weight moving mass of the diaphragm results in a transient response which delivers exceptional clarity, intelligibility and throw. Ribbon drivers feature extreme low distortion, only 1/10th of the THD of existing (compression or dome) drivers. Because of the different working principle, a ribbon driver does not have a "compression threshold", maintaining the same tonal balance at all sound pressure levels. The flat-response caters for increased "gain-before-feedback" even in the most critical circumstances. 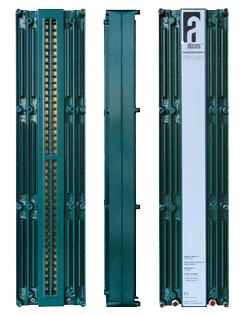 The RBN1801 is an 18" professional ribbon transducer with a peak power handling of 3000W. and is currently the most powerful ribbon driver on the market. It features two patents. Alcons’ RBN transducers are the only pro-ribbon drivers with “Real-90” horizontal dispersion up to 20kHz. The effective radiation length of 18" / 46cm. 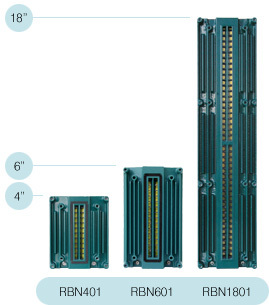 offers an extreme power handling of 210W RMS and 3kW peak (for 200ms, which is ten times the industry standard) and a very high efficiency of 108dB with 1Watt @ 1m. With a 90-degree wave-guide, this efficiency even rises to 110dB, with a frequency operating range of 1kHz. - 20kHz. (+/-3dB) and a maximum SPL of 145dB. The RBN401 is a scaled-down version of the RBN601. With a power handling of 50W/800W and an efficiency of 100dB (log average 2-10 kHz.) it's "the Hulk"s smaller brother, therefore named "baby Hulk". Philip de Haan: "During the market research we found that not only the technology but also accuracy of the production process is critical with this type of technology. True craftsmanship and experience are essential for production stability with this type of transducer technology." Ribbon tweeters have traditionally been characterized as fragile, with low power handling, low efficiency and low impedance. With the low weight moving mass, the ribbon offers considerable advantages in response especially at frequencies of above 8kHz. In this "fidelity-area" of the sound spectrum, the ribbon doesn't suffer from "cone break-up" and the distortion resulting from that. The RBN pro-ribbon drivers are truly a leap forward in ribbon transducers specifically and high SPL sound reproduction in general. "Today's status of our ribbon technology proves we're heading for the right direction in the evolution of professional sound reinforcement. Currently only a small piece of the great potential of this technology is utilized", says de Haan.